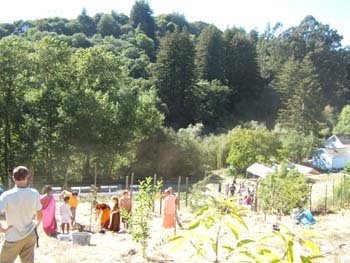 Today the devotees were in the orchard planting fruit trees for the pleasure of Srila Govinda Maharaj. 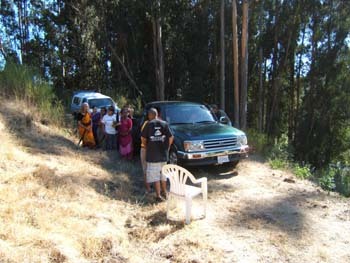 Raja Ram prabhu lead a sweet kirtan as the devotees climbed the hill. 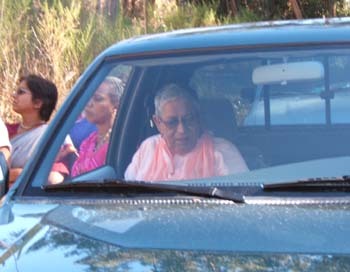 Srila Gurudev arrived in Hasya Priya Prabhu's truck. 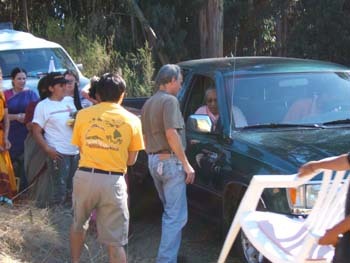 It was a hot day but very cool in the truck. 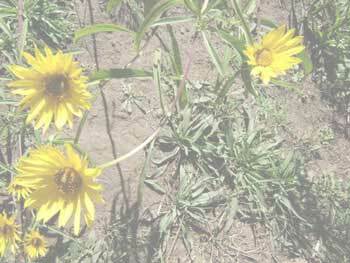 while the others accompanied him. 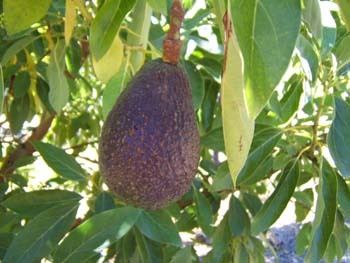 Entering the orchard you see many avocado trees. All of the trees are labeled very nicely. 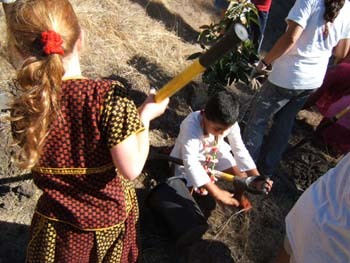 Devaki and Nimai worked hard to dig holes for the new trees. 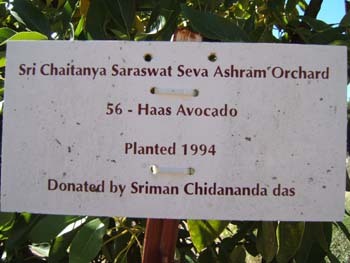 Ramanuga Prabhu from Tijuana replanted the trees. 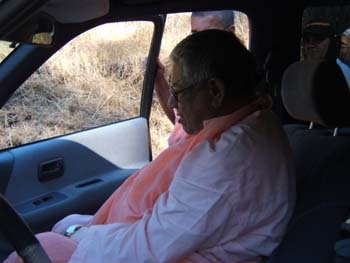 Other devotees carried buckets of water and put the barbed wire around the roots to prevent naughty gofers from eating them. 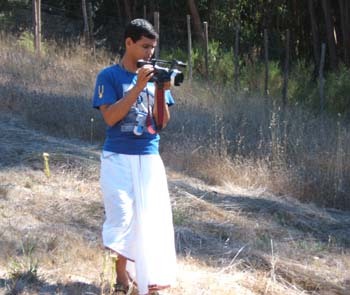 In the meantime, Ranajit Prabhu captured all of the day's events. 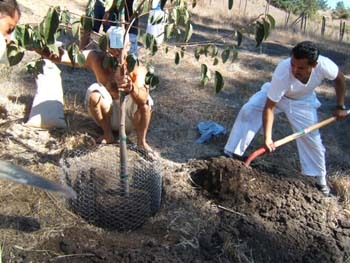 Siddhanti Maharaj made sure that all of the trees were nourished and well taken care of. 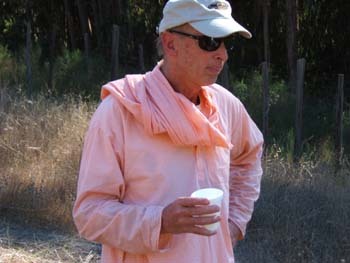 Everybody asked him, "Where do I pour this bucket of water?" 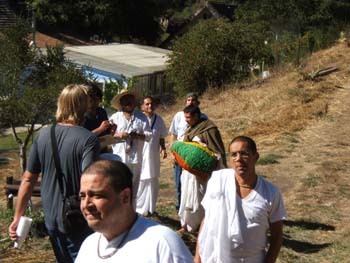 as they carried heavy loads up the hill.